There is no better breakfast/lunch/dinner/snack than a salt bagel with a nice slice of pork roll, an over easy egg, and ketchup (both on the sandwich and extra for dipping). Let me break down the sandwich piece by piece and explain why it is so delicious. For years I was an extremely picky eater. At dinner I would refuse my meals and instead just eat half of the loaf of bread on the table. I do not know if I really did not like the other food or I just did not think it tasted as good as bread does. Since my childhood I have become a much less picky eater with favorite fresh ingredients including rabbit, bison, raw fish, and cactus. Even with my willingness and enjoyment in consuming other foods, I still hold a true love for bread. This makes the salt bagel an essential part of the sandwich. Although it is also delicious on a brioche b un or a Kaiser roll, the best way is on a salt bagel. This brings me to where to get the BEST salt bagel, a small bagel shop in Long Beach Island, NJ called Bageleddi’s. My love for Bageleddi’s comes from summers at the beach with my grandmother. We would wake up early and run to the bagel shop before the line got too long. The smell of fresh bagels in the ovens was always wafting through the shop. If you got there early enough, which we often did, the bagels were still hot and did not even make it home without being half eaten. 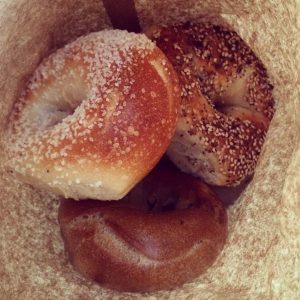 I cannot count how many “bagels so fresh they should be slapped!” t-shirts I have accumulated over the years or how many rainstorms I have trekked through at the crack of dawn, but their bagels never disappoint. The next ingredient is pork roll, also known as Taylor ham. Unless you are from the Philadelphia area I am sure you do not have the faintest clue as to what pork roll is and you probably find the name rather off putting. I do not know how to accurately describe it, but I promise it is AMAZING. Pork roll is another ingredient exposed to me by my grandparents. Whenever I stayed over at their house I would wake up to the smell of pork roll cooking on the stove. Since it has not made it out of the Philadelphia radius it has become a strong memory of family and being home. In fact my mom makes it the night I get home from college each semester. There is little sentiment to the egg. The runny yolk just tastes delicious once it is mixed with the ketchup. The sentimentality with ketchup comes from a story that most of my friends find repulsive, but growing up I ate a lot of ketchup sandwiches. Literally sliced white bread with ketchup on it. My mom did not like deli meat and so if we wanted a sandwich in our lunchboxes all we had was bread and ketchup. To this day I quite enjoy a ketchup sandwich. So how do I go from a sandwich where two of the four ingredients are processed to being passionate about fresh produce and shopping almost strictly at Farmers’ Markets? My pork roll sandwich has its roots in sentimentality and will always be my favorite dish, but I have definitely had better meals, both in taste and nutritional senses. But what I did get from my pork roll sandwich is the experience of supporting a small family business and knowing the producers at Bageleddi’s, learning the limitation of products based off of region with the pork roll, and the humbleness of a ketchup sandwich. Knowing where my food comes from is important to me and so is acknowledging that food can only naturally reach a limited radius. Locality has become a big interest of mine, like how can I eat a mango during a Boston snowstorm? How has the mango been altered? How many miles has it traveled and how much fossil fuel has it burned? Although my favorite food has not matured from my childhood my outlook on food systems and sustainability continues to grow. 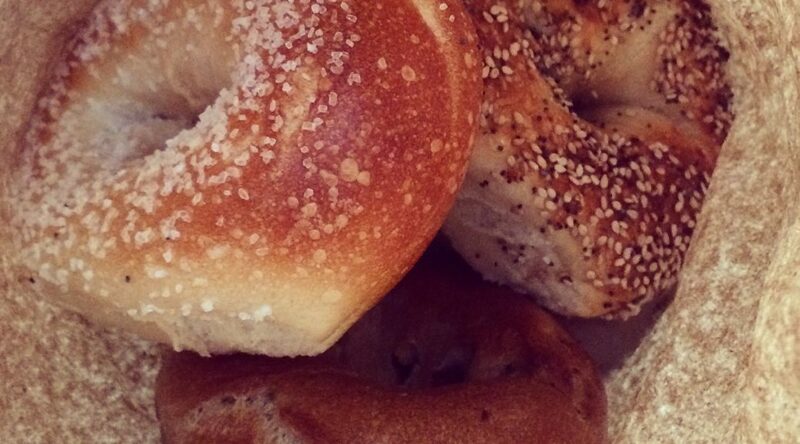 Description of the hot, fresh bagels… Oh my, deliciousness. Thanks for sharing your sweet story of the salt bagel, pork roll, over-easy egg, and ketchup sandwich. I hope you’re enjoying Louisville! A great city!